Clay engineering bricks are defined as "brick sized fired clay units having a dense and strong semi vitreous body, conforming to defined limits for water absorption and compressive strength. 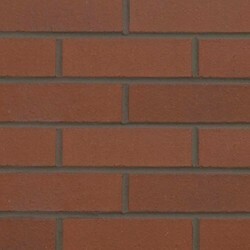 Stronger and less porous engineering bricks (UK Class A) are usually blue due to the higher firing temperature whilst class B bricks are usually red. Class A bricks have a strength of 125N/mm² and water absorption of less than 4.5%; Class B bricks have a strength greater than 75N/mm² and water absorption of less than 7%. 65MM CLASS B RED ENGINEERING BRICK (452 PER PACK)This product is normally supplied in ..
65MM PERFORATED BLUE ENGINEERING BRICK K209 (Qty Per Pack 400)65mm Wienerberger Blue Eng Perf K209 B..
65MM SOLID BLUE ENGINEERING BRICK This product is normally supplied in packs of 400.Constructionline..